Daily Illuminator: Car Wars Sixth Edition Dice! 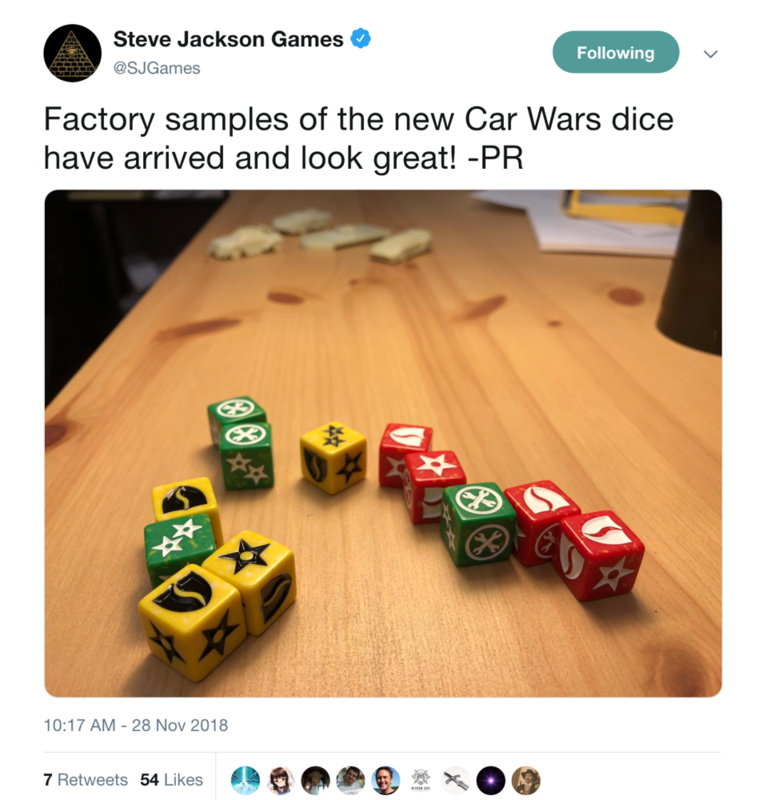 January 10, 2019: Car Wars Sixth Edition Dice! Are you following our Twitter account? If not, you may have missed out on the first pics of our Car Wars Sixth Edition dice. Manufactured by our friends at GPI, these new dice are the first production-ready parts of the new edition of Car Wars (that we've been working on for several years). What makes these dice especially important is what they represent: The finish line is approaching! We need to refine the molds slightly, but we are now actively entering the final stages of our design and development work and preparing for both the graphics work and, more exciting for all of us, constructing a Kickstarter campaign for the new game. Please be sure to follow us on Twitter, Facebook, and Kickstarter for more information and for notification when the Car Wars Sixth Edition crowdfunding campaign launches. We don't have an exact date at the moment, but we are now 99% certain that we'll be taking the game to Kickstarter this year!